Looking to make a splash on your next vacation? We’ve rounded up five of our favourite resorts where free and unlimited access to the water park is included so you can whoosh down the free fall slide, tame the monster roller coaster (if you dare!) or bliss out on the lazy river as many times as you like. Adrenaline junkies will meet their match in Punta Cana at Splash Water World. 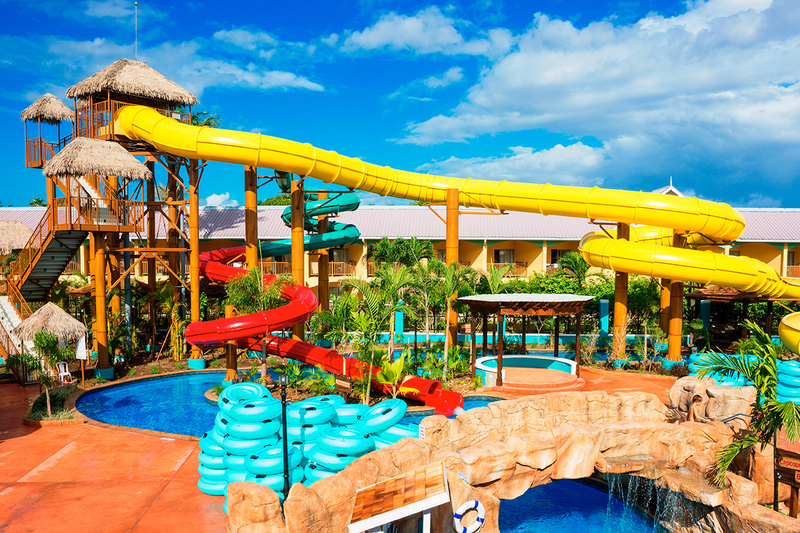 Opened just last year in Punta Cana, this was RIU Hotels & Resorts’ first ever resort water park; full of thrilling slides and water attractions that can be accessed for free by five surrounding RIU properties—a favourite being Riu Bambu which is situated on the stunning Arena Gorda Beach. 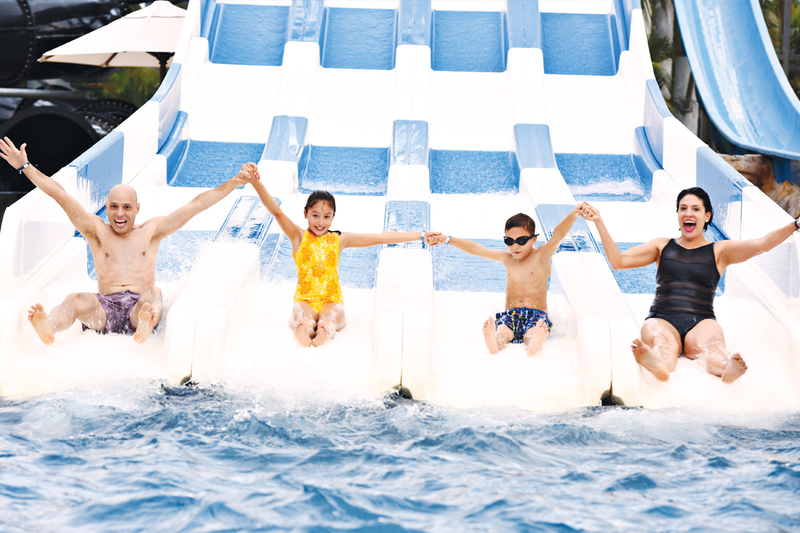 Guests can whoosh down adrenaline pumping slides such as a four-lane high speed slide, or one that propels a person towards a pool, or even a free-falling slide. Children can make a splash in a dedicated children’s area complete with water toys. When you’re not zooming down waterslides: The RiuLand kids club offers exciting activities, a playground a dedicated kids pool. Or, the whole family can try out some water sports together such as windsurfing, kayaking and snorkelling. Waterslide enthusiasts will find one of the largest waterparks in Jamaica if they opt for a stay at award-wining Jewel Runaway Bay Beach & Golf Resort. 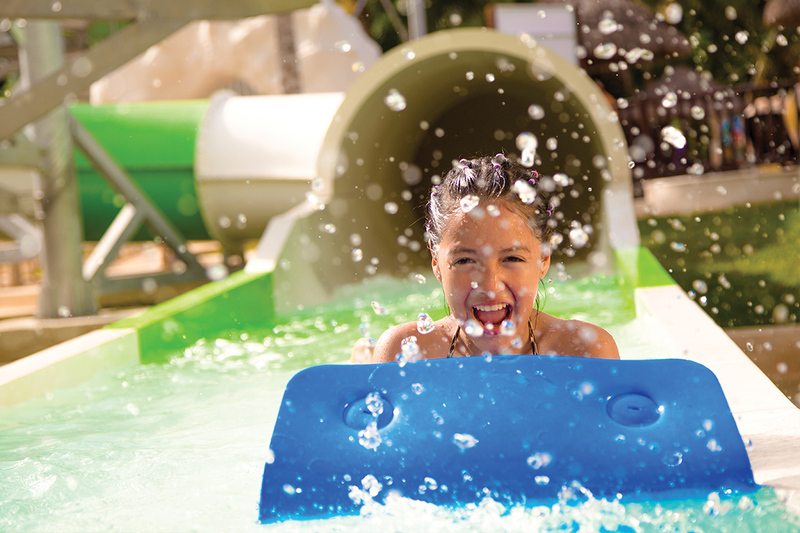 The Jewel Lagoon Water Park features attractions for all types of guests: from a family raft ride and super-speed slide, to interactive multi-level play stations and splashdown pools. There’s also a lazy river with grottos and waterfalls, mini-kids slides and splash zone. When you’re not zooming down waterslides: Aside from enjoying free access to the water park, you could also enjoy a complimentary round of golf at the nearby 18-hole Championship course, or take advantage of other inclusions such as archery, laser tag, beach volleyball and more. Our Kidcationers put our family resorts to the test to make sure they have the best family-friendly accommodations and activities, the best ice cream and the best pools and water parks. 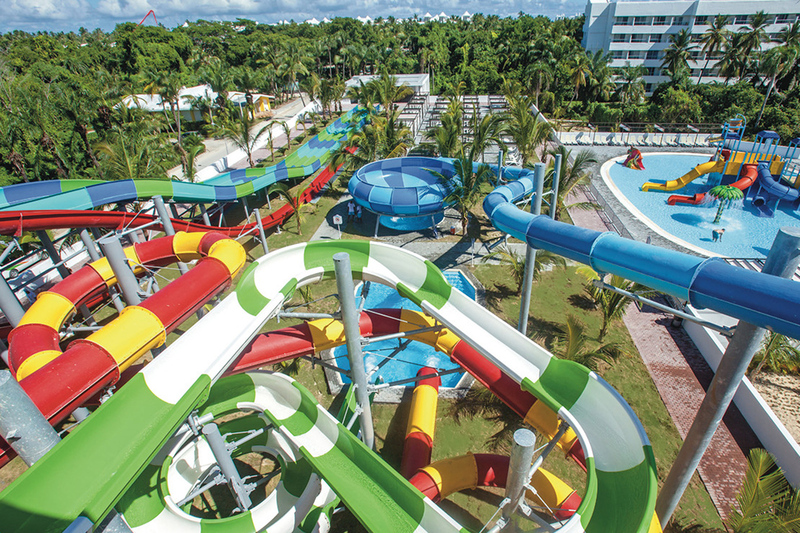 Recently Kidcationer Aziz from Mississauga, Ontario gave Sandos Caracol Eco Resort his seal of approval—with its recently expanded water park being one of his favourite features. Boasting a total of 29 slides, this exciting water park kept Aziz pretty busy on his Kidcation. When you’re not zooming down waterslides: Enjoy nearby natural attractions such as snorkelling in a cenote. Evening live Xcalacoco Events teach about ancient Mayan life and regional history, culture and nature. Royalton Blue Waters is a favourite among travellers whether they’re vacationing with the family or friends. Kids can let their imaginations run wild at the Pirate-themed splash park, full of exciting slides, water spritzers and splash pads that will also tame that tropical heat. Those looking to cool off in a more relaxing way can float down the lazy river that meanders throughout the resort. When you’re not zooming down waterslides: Parents will appreciate the wide variety of supervised activities available at the kids club, while teens can hang out in their own lounge. The whole family can enjoy some snorkelling, kayaking, pool Olympics and more together. 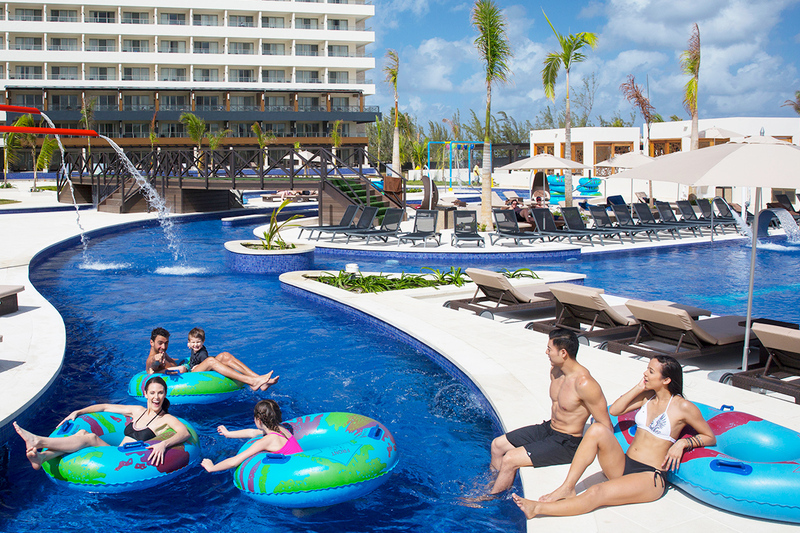 For everyone who loves an exhilarating day of jumping, sliding or floating in the water, Memories Splash Punta Cana has a water feature for everyone. As the largest water park in the Caribbean, guests can get a soaking cool in the wave pool that cascades gallons of water on swimmers from a giant bucket or check out the splash pads and spray grounds. Thrill seekers will love zooming down one of the thrilling waterslides like the monstrous Roller Coaster and Giant Hydrotube or the Snakes Waterslide perfect for mini-adventurers. When you’re not zooming down waterslides: The whole family can get together with some beach volleyball or tennis. For parents seeking some downtime, little ones can participate in a supervised and engaging Kids’ Adventure program while the older kids can hang out in the teens lounge.